Change the names, change the dates—Every time I write about gun violence it’s the same story. Will this time be different? European countries have virtually ended gun violence with swift and brave actions to make guns difficult to buy or illegal. Yet here in America our love-affair with our cowboy image appears to hold greater sway than the safety of our citizens. Now that the children who’ve experiences all this terror are growing up and speaking out, is America listening? Here’s an article I wrote a few years ago about a brave group of women (and men) who have been fighting for common-sense gun laws since their own loved ones were killed by gun violence. Their losses and the losses of all those touched by gun violence were all senseless and could have been prevented. Let us not forget their sons and daughters. Let us step up and have the courage to create real change before yet another story gets written. Orange is the color that hunters wear in the woods to avoid being shot by accident. Orange was the color worn by the mourning friends of Hadiya Pendleton, the 15-year-old Chicago student who was shot and killed only one week after performing with her high school band at President Obama’s second inaugural parade. Orange has become the color of a movement to end gun violence in America. It is the color that marched across our country on National Gun Violence Awareness day, on June 2, to stop more children from being shot. The marches were organized by Moms Demand Action, Everytown For Gun Safety, and Wear Orange. Their demands for “common sense” gun laws include: ending open carry laws (especially in places like grocery stores and college campuses), promoting responsible gun ownership (smartguns, gun safes, and safety catches), banning sales of semi-automatic weapons, expanding universal background checks, taxing bullet sales, and increasing gun safety education. Although even Newtown’s elementary school massacre could not prompt Congress to stand up to the NRA for tougher gun laws, the Brady Campaign, Everytown, and Moms Demand Action continue to push for state and federal laws that will make it harder for guns to reach the hands of people with mental illnesses, violent histories, or children. Tragically, the day before these protests, there was yet another college shooting, this time at UCLA; this has become our nation’s new normal. Everytown has been compiling statistics on a map of the US, flooded with red dots, to signify all the schools (from elementary schools through colleges) where blood has been shed, including names of all the victims. Since 2013 there have been 186 school shootings; that’s an average of one a week. Every day in the US, an average of 33 people are murdered with guns, while another 53 die from gun accidents or suicide. Nicole Gardner marched for her daughter Ronique Gardner-Williams who was shot in a drive-by shooting in Richmond, CA. Ronique, a second year college student studying Veterinary medicine, was in a car with friends driving in the Richmond district; she was in the wrong place, at the wrong time. A woman, bearing the signature orange t-shirt, wrapped her arm around Ms. Gardner. “You don’t have to talk,” she said. “Just hand out your fliers.” Gardner’s fliers included a photo of her slain daughter along with a plea to witnesses to come forth. Another mother in mourning came over; the two survivors whispered to one another. Then they lifted their heads to face the cameras. A young woman pushed a stroller, bearing Nicole’s remaining child, a little girl, too young to understand the magnitude of the day’s events, but one who would, in years to come, feel the weight of her mother’s grief and her big sister’s absence. Mattie Scott marched as she’s been marching for the last twenty years, for her youngest son George C. Scott, shot the day before his son’s sixth birthday. George was an activist trying to better the lives of young males of color. Scott marched for her nephew, Timothy Scott, also shot and killed, at the age of 24. 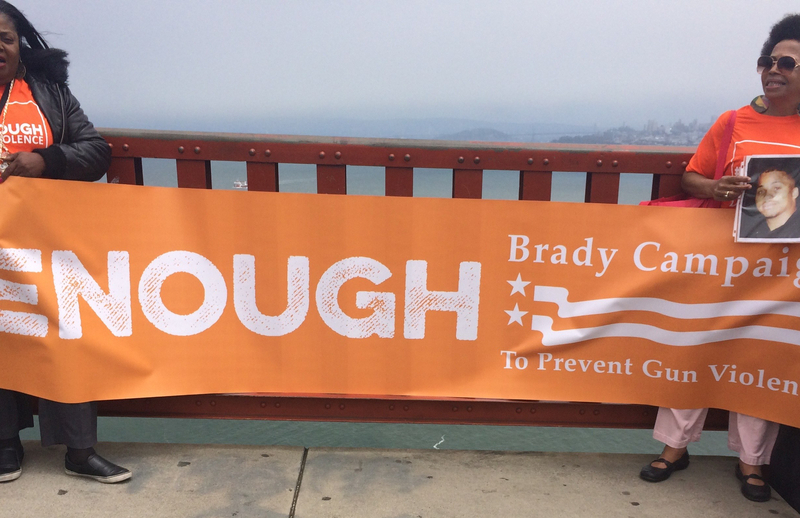 Scott marched for her niece, who committed suicide by jumping off the Golden Gate Bridge. Scott has channeled her outrage into action, working tirelessly to combat violence in the African-American community and San Francisco’s minority communities. She is the founder of Healing 4 Our Families & Our Nation, President of the SF Brady Campaign, and Chapter Leader of Mother’s in Charge. She has spent the last twenty years advocating for stronger gun-control laws as well as organizing to heal the trauma faced by families impacted by gun violence. My own sons marched in front of me, twin nine-year-old boys who were healthy, safe, and as of yet, lucky enough to be untouched by such violence. All around us marched women and men who had not been so lucky. I was reminded of how much work a parent puts in to teach their children right from wrong—and how fast a bullet can silence everything. One thing has become imminently clear in the last ten years—none of us are truly immune to gun violence any more. While it remains more common in inner-city neighborhoods, gun violence has recently reached its ugly arms outside of any particular neighborhood, and into the kinds of spaces we used to deem safe: elementary schools, middle schools, high schools, and colleges, churches, movie theaters, and grocery stores. At the end of the two-hour march from San Francisco to Marin and back again, the marchers gathered around the flag pole, and beneath the flapping red, white, and blue stars and stripes, there stood an orange halo. This piece first appeared at SocialEarth on Thursday.